Noble Estate’s vineyard in Eugene, Oregon. 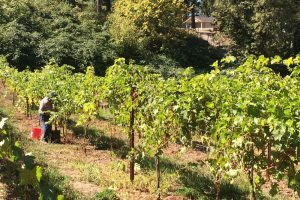 Noble Estate Vineyard and Winery was established in Eugene, Oregon with the planting of pinot noir in 1999. Owner and Winemaker Mark Jurasevich found inspiration for the name of the winery in his love for noble fir trees and the stunning landscape of the South Willamette Valley. 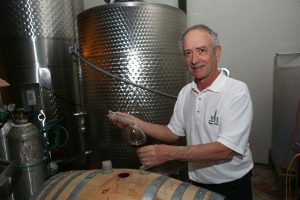 In 2000, Mark produced Noble Estate’s first commercially available wines and opened the Vineyard tasting room in 2005. Later in 2013, Mark opened the Urban tasting room in West Eugene and the Newport location in 2015. Today, Noble Estate is family-owned and produces nearly 20 types of award-winning wines. Our vineyard has been certified by LIVE and Salmon-Safe since 2010 for sustainable winemaking practices. LIVE has a rigorous certification process and Noble Estate is passionate about growing grapes in a way that ensures the terroir and local ecosystems are protected for the future. From grape to bottle, Noble Estate wines are hand-crafted by Owner Mark Jurasevich and his team. Named wine region of the year by Wine Enthusiast in 2016, the Willamette Valley fosters the ideal climate for winemaking. We grow pinot noir, pinot gris, muscat, and rieseling grapes at the vineyard in nutrient-rich Bellpine (sedimentary) and Jory (volcanic) soil. During the winemaking process, the grapes are hand-picked, pressed, fermented, bottled, corked, and labeled by our team. Our labels embody the view from our Vineyard tasting room and offer food pairing suggestions.